If you hold Home button, you can easily access the Recent applications screen and also a link to the Task manager. This feature is allowing you to see your recently used apps. You should know that when you exit an app using the home button, the application will be saved and will remain active into the background. If you press the Back button, the application will end at this point. Both buttons will add the application to the list. You can find the name of applications into the left of a large thumbnail. You can scroll up and down the list and choose the one you want. 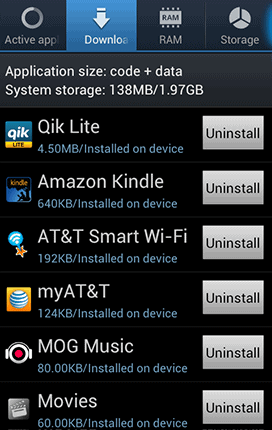 If you want to remove an application from the list, you will simply need to tap and hold it. If you want to select one, you will simply tap it. To remove all apps, you will tap on Remove All. If you want to have a quick memory management, you will need to use the Task Manager. 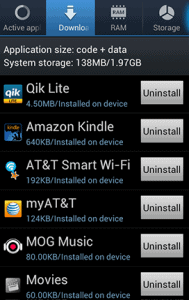 You can view, run or exit the applications that you use and also uninstall apps. You will find the feature on Recent applications screen. This feature shows you all running applications. Touch End button if you want to close one or End all if you want to close all. This feature is showing all downloaded applications. This feature will also allow you to uninstall an application. This feature shows your Ram memory usage. You will improve the performance of your Samsung Galaxy Note 2 if you clear the Ram. Keep in mind that this feature will not uninstall your applications. This feature displays a summary of your device’s system storage, used and available, and the amount of information stored on an installed microSD card. The Help tab displays useful information on how to extend the battery life of your device.